Shares of Wynn Resorts plunged as much as 15% after the casino operator reported adjusted third-quarter earnings in line with expectations and sales that beat forecasts but in a subsequent call with analysts said it was seeing a "slowdown" at its Macau location, especially from the highly profitably high rollers. While CEO Matthew Maddox said results were strong during China's seven-day Golden Week holiday, since then attendance has been "choppy" during weekdays and "sporadic" on the weekends. "So what we've seen post-Golden Week has been a slowdown. And we've seen it, in particular, in the premium end of the business, premium mass, premium slots, and VIP," Maddox said on Wednesday's earnings call. That bodes poorly for the gambling giant, which derives the "vast majority" of its pretax earnings from its high-end offerings. "What we've always focused on in our business is the premium end, and we always will because in Macau while that will be the first to retract in these times, it's also the first to expand as you come out of these slowdowns," Maddox added. Of course, that Macau is "retracting" now is another warning sign about not only the strength, or rather weakness, of China's economy, and by implication, the global economy. Maddox confirmed as much saying that while a contraction in Macau is now being observed, which will likely impact the company's bottom line, the CEO also observed that there seems to be a deceleration in the premium market globally, with softer performance in Singapore and Las Vegas as well. [A]s we've seen in the past, whether it was in 2003 with SARS and what happened at the VIP market and the recession in 2008 and 2009, in 2014, when we saw the premium in VIP market started to slow down globally, that always impacted Las Vegas as well. Needless to say, any time a company mentions recessionary conditions in its market, the market sells first and asks questions later. Sure enough, Nomura Instinet analyst Harry Curtis said that "WYNN's messaging was negative, which sent the shares down 10 percent in a heartbeat." "Management tried to explain the worse-than-expected trend as a loss of confidence especially among premium players," Curtis added, quoted by CNBC. "We agree, but believe that some historic perspective should have been provided: that in markets with slowing economies, players keep visiting casinos and their ability to wager may not be impaired, but their spend/bet declines." Whatever the reason, today's drop in Wynn shares was the latest hit to company shareholders, who were already nursing a 30% decline in 2018 even before the company's third-quarter results. While concerns have lingered about whether a dip in economic growth could hit the gambling industry, some have speculated that the culprit is the ongoing bear market in Chinese stocks. The Shanghai composite has slumped 22.8% during the last year, one of the worst performers of the closely followed global indexes. 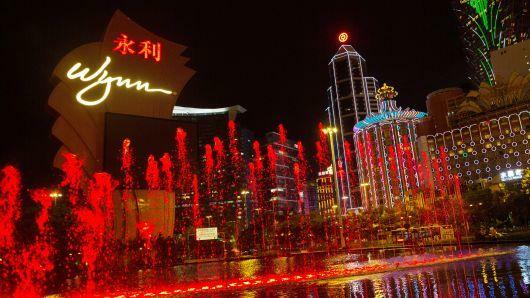 Some has suggested that any improvement in trade relations between Beijing and Washington could help the Chinese economy and Wynn's performance in Macau.